ECS FRANCE MAGNET ENGINEERING is representative in France of BROCKHAUS MEASUREMENTS. 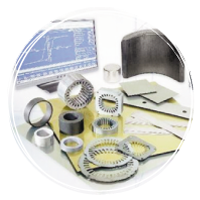 BROCKHAUS MEASUREMENTS is a German company all over the world known and recognized for its big expertise in the field of the tests of electro-technic materials. The majority of the customers of BROCKHAUS MEASUREMENTS are manufacturers of electric engines, generators or transformers. But it also touches producers of steel, notably those specialized in the operations of lamination, suppliers of magnetic products, as well as numerous institutes and university research laboratories. In the course of numerous years of experiment, and in narrow collaboration with its customers, BROCKHAUS MEASUREMENTS became the European leader of the systems of measurement for the quality control of the magnetic materials. Measuring Technology for soft magnetic materials. Measuring Technology for hard magnetic materials.